The congregation of Holy Cross is keen on promoting Father Peyton’s cause for beatification, because we are convinced of his holiness. As Pope John Paul II said some years ago, Father Peyton was a man of great faith, allowing his life and ministry always to be guided by the Spirit. After his miraculous cure, he was entrusted with a special mission, the mission of spreading the Family Rosary throughout the world. I would like to highlight the spiritual and pastoral intuitions of the Servant of God who gave priority to deep human and spiritual values in his life. The first intuition that I consider to be part of Father Peyton’s legacy to us is the fact that he brought out the essential role of the devotion to Mary in Christian life. We know that, for many centuries, the intercessory role of Mary has been put into question by our Protestant brethren. What Father Peyton did was not only to highlight the role of Mary in the history of salvation, but also to strengthen the Catholic identity and avoid what was called “Mariolatry” or exaggerated importance given to Mary. In order to foster authentic devotion to Mary in the Church, Father Peyton gave importance to the Rosary, which is the most simple prayer available to Christians. It is a prayer that even children can use with great benefit. However, Father Peyton made it a point to give a Gospel orientation to that prayer so that all those who use it might be led to Jesus through Mary. That is why meditation on the mysteries of our salvation is an essential orientation given to every decade of the Rosary prayer. Father Peyton has also helped millions of Christians all over the world to rediscover the importance of prayer in Christian life, especially at a time in history when modern trends incite people to believe that they can manage very well without God. Father Peyton was even accused of giving exclusive importance to prayer and overlooking the social realities like the problems of poverty prevailing in the world. He answered the objection by paying special attention to the sick and the afflicted in his personal contacts and by reminding the world that social action without prayer and reference to God loses its soul. Having come originally from a very poor background, Father Peyton was conscious of the crisis affecting the family in the midst of sociological changes. He witnessed the disintegration of family life in modern societies and felt the need of doing something concrete to strengthen the family bonds especially among Christians. He was fully aware of the potential of the family to transmit the faith and was convinced that the Church is called, especially in these modern times, to contribute to the renewal of the family. It is in that context of disintegration of family values that Father Peyton understood the role of family prayer, and especially the Rosary, for healing, renewing and strengthening the family. The slogan that he coined – “The family that prays together stays together” – found an echo in the hearts of all those who were looking for ways of keeping their family members united while the mentality prevailing in the world tended to tear the family apart. Father Peyton was filled with such apostolic zeal that he understood the need of using the media, especially radio and television, as means of evangelization. He did not hesitate to tap the talents of artists and cinema actors to spread his message to the families not only in America, but all over the world. He was a man of his time. He saw how the media could contribute to foster the presence of the Church in every culture. 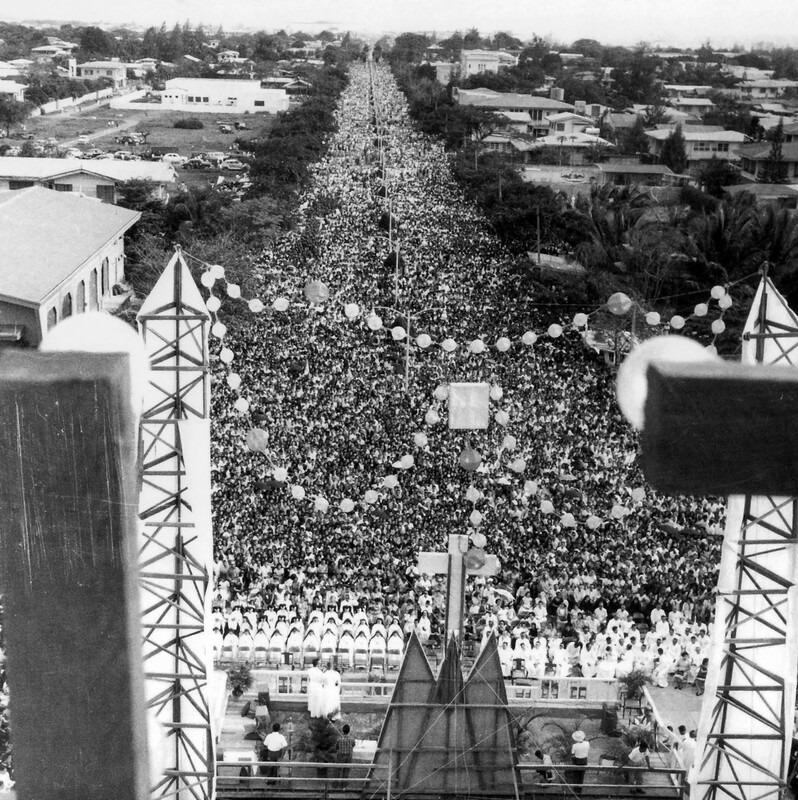 The many Rosary Rallies that he conducted in every continent and which, sometimes, were attended by more than 2 million people at a time, contributed very much to the evangelization of the masses. He succeeded in reaching out to millions of people with the message of the Gospel in their own neighborhoods. 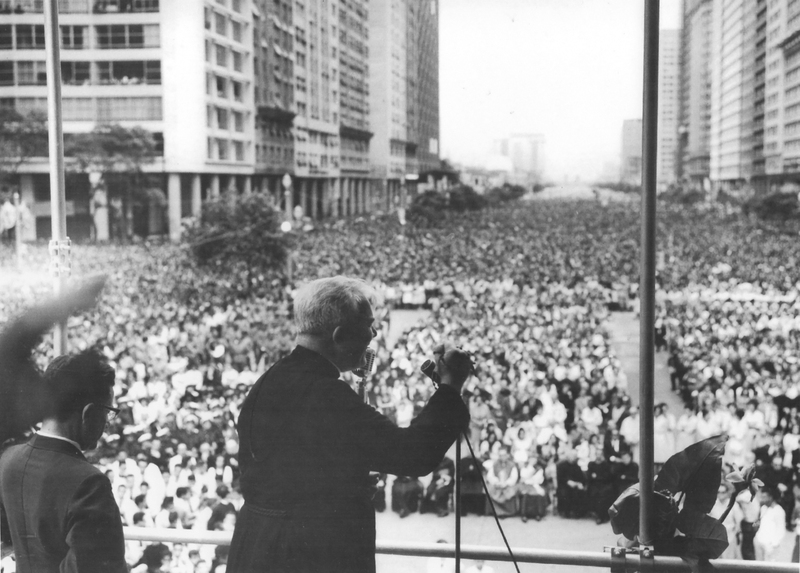 For him, the Rosary Crusade was seen as a tool of evangelization. It was a call addressed to all Christian families to rediscover the centrality of Christ in their lives and the important role of Mary in leading them to her Son, Jesus. The Rosary Crusade could not have been organized without the collaboration of thousands of lay people who volunteered to take care of the material organization of all the Rallies. By seeking the help of lay people in organizing Rallies in every country that he visited, Father Peyton, with the help of his collaborators from the Congregation of Holy Cross, paid special attention to the formation of lay leaders as agents of evangelization. It is evident that the Rosary Crusade would have been impossible without them. The formation of these lay collaborators was seen by him as a way of supporting the work of the local Church. And before leaving any country where Rallies were conducted, he and his priests collaborators made it a point to leave behind a structure that would help in continuing the work of evangelization there. In this context, I am happy to underline the wonderful work that Mr. Mrs. Carvalho, Mrs Theresamma and all their collaborators have been doing in Bangalore in that line during the past 13 years for English as well as Kannada and Tamil speaking groups. I believe that they understood very well the spirit that animated Father Peyton and they felt the need of offering their precious collaboration as lay people in spreading the Family Rosary and devotion to Mary among Catholic families in our archdiocese. In your name and in the name of the local Church, I take this opportunity to thank them all for the wonderful work of evangelization they have been carrying out over the years. Finally, I would like to conclude by saying that the holiness of Father Peyton had to do with his openness to the Spirit of Jesus. His intuitions continue to be relevant in our times, because family values are even more often threatened today than they were in the time of Father Peyton. All of us here present are invited to develop this legacy of Father Peyton and pray that soon the Church may officially recognize his holiness and propose him to the veneration of the faithful all over the world.